You can easily lose files on a variety of storage devices, and it doesn’t have to be your fault entirely. Drives can become corrupt, or items may have been deleted by mistake. 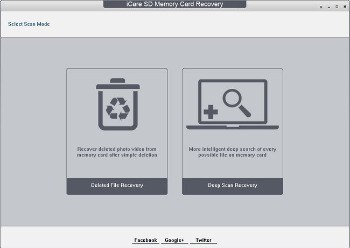 Regardless of the case, iCare SD Memory Card Recovery can help you bring them back from damaged USB flash drives and SD memory cards. There’s also the possibility to search for a particular file with the built-in functions. If you’re not sure by name, the application offers a file viewer which is fitted with features to display text content, HEX code, as well as a preview if possible. The last step of the operation is to choose a save location for selected files. A tree list is put at your disposal for selection of a folder, but you can also paste the path in the dedicated field. It’s highly recommended to use a different drive. The application issues a warning when attempting to save to the same drive. Taking everything into consideration, we can state that iCare SD Memory Card Recovery is sure to come in handy if you can’t access files on your SD card or USB flash drive or you just accidentally deleted files you need. It also comes with an in-depth scan operation for file lost during a format operation.